There are only a few things that appeal to adventure enthusiasts more than the thrill of riding on the wild waters of untamed rivers or white water rafting as it is called. The mighty rivers flowing down from the heights of the Himalayas make India one of the world's best places for adventure. While the best of rafting options lie north, in the Himalayan waters, South, West and East has also seen recently the development of the sport. 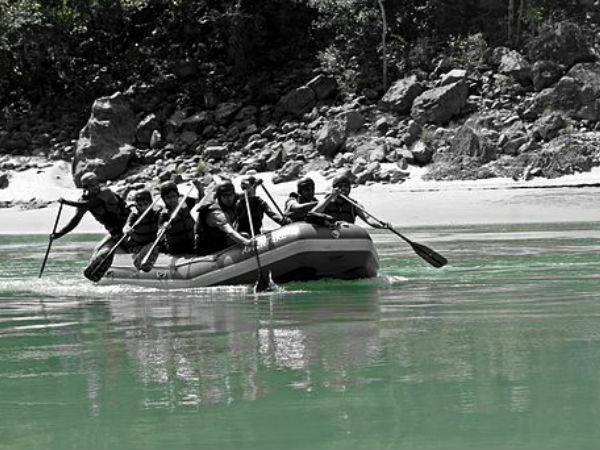 Here is a guide to the 5 river rafting destinations in India. The Ganga at Rishikesh is one of the world's best rivers to raft. A 16 km stretch from Shivpuri to Lakshman Jhula in Rishikesh, this stretch is rich with whirlpools and rapids. There are as many as 13 rapids with curious names like Return To Sender, Roller Coaster, Three Blind Mice,Double Trouble, Tee Off and Golf Course. The best season to go there is from September to June and travellers can enjoy the water sport to its maximum during these months. Rafting through the calm waters. Rafting is held between Padum and Zimo regions in the Zanskar river gorge. Walls of mountains rise to hundreds of feet on both sides. The rafting route ends as the river merges with the Indus. The route passes through some very rough terrains and remote places in Ladakh. Travellers rafting here can amaze at the beauty of the scenic surroundings and also enjoy the serenity this place has to offer. Rafters in the Zanskar river. The rugged Teesta River, the main river of Sikkim and Darjeeling, is another popular destination to go to for river rafting. The turbulent Rangit, a tributary of the Teesta, with its multi-dimensional rapids, offers a challenge to more experienced rafters. Paddle rafting and oar rafting can also be done in the here. It is a haven for rafting enthusiasts who can indulge in this water sport and tackle some of the best rapids here. Enjoy river rafting in the Teesta River. River Barapole in Coorg provides for an excellent rafting opportunity. Situated in the Western Ghats and edging along the Deccan Plateau, there are approximately 4 to 5 rapids in the regular upper section & about 6 to 7 rapids in the lower section. Rafting enthusiasts come here in large numbers to indulge in this sport and also to admire the beautiful surroundings of this region. The Kundalika river at Kolad is an excellent rafting destination South of the Himalayas. Situated amidst the magnificent Sahyadris, the almost 15 km stretch of rapids along this river provides ample opportunities for an exciting experience. The best months for rafting are in the months of monsoon when the water levels are high.